This article is about the guest star. 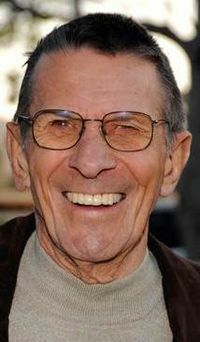 For the character, see Leonard Nimoy (character). Leonard Simon Nimoy (March 26, 1931 – February 27, 2015) was an American actor, film director, photographer, poet, and singer-songwriter, best known for his role as Spock on Star Trek. He voiced himself in the season 4 episode "Marge vs. the Monorail", which was originally a role for former Star Trek co-star George Takei and the season 8 episode "The Springfield Files". A clip of Nimoy from "Marge vs. the Monorail" was used in the opening montage of the season 30 premiere "Bart's Not Dead". After his death, the season 26 episode "The Princess Guide" was dedicated to him. Leonard Nimoy was voted 12th in IGN's "Top 25 Simpsons Guest Stars". Modified on October 4, 2018, at 17:31.